This week, Glenn answers questions about deauthorizing software, reinstalling AirPort Utility, managing a Fusion drive, and Migration Assistant. This week, Mac 911 focuses on OS X and things that are missing or migrating. I answer questions about deauthorizing software on a Mac before a migration, where to find old Wi-Fi utility software and firmware, deleting a Fusion drive’s extra partition, and a small array of Migration Assistant questions. Is there a place on OS X Yosemite to find programs that are currently authorized on my Mac? I am specifically interested in those that must be deauthorized before moving to a new device. I’m already aware iTunes must be. As Philip notes, iTunes lets you deauthorize a computer. (Account > Deauthorize This Computer.) That frees up a slot in the total count of five computers you can use the same music and videos on with the same iTunes account. For general software, if it’s purchased from the Mac App Store, there’s no requirement to deauthorize. As Jason Snell wrote in 2011 when the Mac App Store appeared, there’s no limit on the number of Macs using the same Apple ID that can use software purchased using that Apple ID. 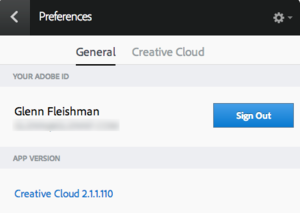 Creative Cloud deauthorizes a computer when you sign out from its helper app. Some individual software packages handle this differently. If you use Adobe software, particularly its Creative Cloud suite, you have a limit as to the number of Macs for which you can be authorized at once. It’s best to use the built-in tool to disconnect before switching to a new computer. In Creative Cloud, click its menu bar icon or bring up its window, click the gear (Settings) icon, choose Preferences, and click Sign Out. If you own any other professional software packages, it’s worth checking their policies individually, but for any software that has to check in with an Internet server to validate it can be used, you can almost always use a website or the software itself to disable its use on other computers. Where did AirPort Utility go? I have a 13-inch laptop at home using previous AirPort Utility software. I lost it by using “clean my Mac” software. How do I restore the lost program? Apple updated its AirPort Utility from version 5, which runs on pre-Lion Macs, to version 6 in 2012. Version 5 also ran on Lion and, if memory serves, Mountain Lion. If you’re running an older version of OS X, you may need version 5.5.3 or 5.6.1. Although Apple doesn’t make most of its utility software available separately—you have to reinstall OS X or copy an application from another Mac—it does have the entire history of AirPort firmware and utility software available for download. You can sort through that page to find the appropriate version. Click Load More Results at the bottom if you don’t see the version you need. 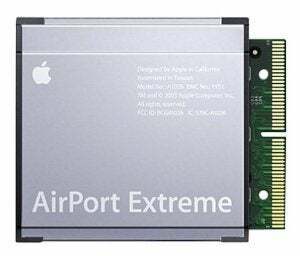 Also note that Apple is retro: the AirPort Extreme Card shown as the graphic on these pages was for sale from about 2003 to 2009 for late-generation PowerPC-based Macs. I would like to delete the Mavericks partition and expand the Yosemite partition to encompass the entire internal hard drive (i.e. return my hard drive to a single partition). However, the controls for doing this in Disk Utility are all unavailable. 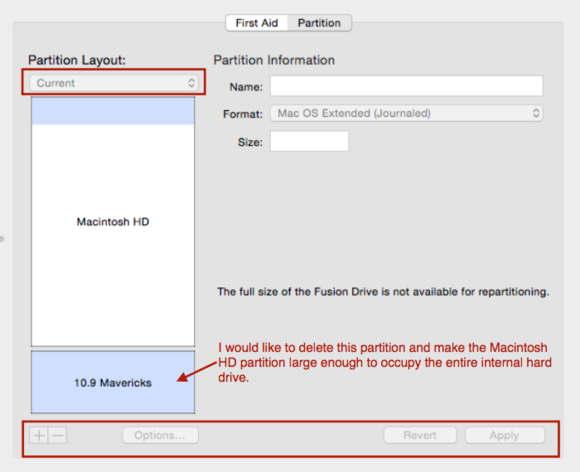 Normally, if you use the GUID Partition Scheme to format a drive—it’s the default format for new Macs—you can create and resize partitions at will. A drive is a physical thing, while partitions are “soft” or “logical,” managed by the startup firmware (EFI) and operating system. Our reader’s illustration of the problem with being unable to delete a partition on a Fusion drive. But Fusion is a finicky beast. For those who don’t have a Fusion drive, it’s a combination of fast SSD storage and a slower hard-disk. OS X automatically optimizes storage so that more frequently used files move to the SSD. This gives you some of the advantages of SSD, such as fast startup time, without the expensive of an SSD the size of your entire volume, nor having to manage moving files around yourself or fit the entire OS on your startup SSD volume. Apple notes you can only create a single partition on a Fusion drive, and Disk Utility places this separate partition exclusively on the hard drive. Once created, Apple offers no advice, nor can I find anyone with advice to offer, on deleting the partition without fully erasing the drive. Since you have a Fusion system, you’d also want to be sure to initialize it via OS X Recovery, which can correctly restore the state. A recent Mac 911 provides details on cloning and restoring an OS X volume. It’s tedious, but it would regain your lost storage. Several readers have questions about Migration Assistant. I’m trying to restore a Time Machine backup of late 2009 MacBook that was running Yosemite to a mid 2010 MacBook currently running Lion. Should I update the 2010 MacBook to Yosemite first? I don’t believe it’s ever possible to use a newer Time Machine backup to restore to an older version of OS X. You might be able to retrieve files and not the entire system, but even then, I’d worry that there would be an incompatibility. For best results, upgrade to Yosemite first, since it sounds like that’s what you’re planning. If you intend to wipe the 2010 MacBook for Yosemite, you can then restore from the Time Machine backup during the setup process. Sarah Melling migrated from a Windows PC to a Mac, and all the creation and modification dates were lost on her artwork files, which she uses for finding and sorting. Unfortunately, there’s no way to solve this in migration, and since you’ve already transferred the files, you probably want a way to fix it. A Better Finder ($15) has the option to read EXIF data from some image formats, which is metadata stored by cameras and other software that can include the creation date. If your files have the creation data embedded in this way, A Better Finder can modify selected files to have a Finder-created date that matches that embedded information. You could also try File Date Changer 5 ($9), which allows changing the dates on one or more files as a batch, though you have to specify the dates manually. This feature is included in a Better Finder. I’ve been migrating files from Mac to Mac for about 20 years now. I’m going to get a new iMac this summer. Is it better to start fresh, and just copy files/folders or does it matter? It’s a mixed bag. I’ve also been migrating Macs for many years, and I typically use Migration Assistant as it’s generally improved enough that I can rely on it to copy everything. Three times I tried to tranfer the Applications folder, and the Migration Assistant does all the work as you would expect, then stops with the finish in sight. Less than one minute to go…nothing happens! In Susie and my case, we had to force shutdown, restart, and try again. Then it worked for each of us the second time. Several colleagues have told us they’ve experienced the same thing, and it may have to do with a timeout related to iCloud logins. We’re always looking for problems to solve! Email us at mac911@macworld.com or tweet them at me (if brief) @glennf. Mac 911 can’t provide direct email responses or answers for every question. For that, turn to AppleCare, an Apple Store Genius bar, or the Apple Support Communities.